WTI and Brent continued to climb higher on Friday and more bullish indicators suggest the rally has only just begun. WTI and Brent held onto their gains during early trading on Friday and look set to close out the week strongly up. The tension between dwindling Iranian supply and the extent to which Saudi Arabia will increase production is sure to dominate the market narrative over the next few weeks. Oil traders almost uniformly bullish. The mood at the Asia Pacific Petroleum Conference (APPEC) in Singapore was highly bullish on oil prices in the short-term, largely because of the supply losses from Iran. Bloomberg also noted that the number of Brent options has surged to its highest ever, “driven by record call trading, including bets on $100.” Oil traders Mercuria and Trafigura see global production losses of about 2 million barrels per day and 1.5 mb/d, respectively, mostly related to Iran. Total SA sees $100 oil. Total SA (NYSE: TOT) CEO Patrick Pouyanne says $100 oil is possible but isn’t excited about it. “I’m not sure it’s a good news” he told Bloomberg. “Even for the oil industry, because you know, when price goes too high then you open the door to your competitors” while demand will likely decline, he said. Saudi Arabia fears supply glut. 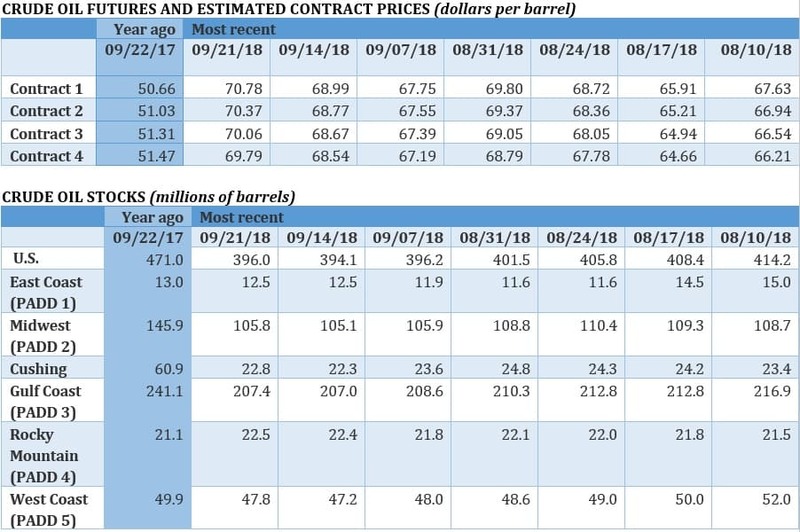 OPEC+ decided against further production gains last weekend, although Saudi Arabia has indicated it would increase production in September and October. However, Saudi Arabia is also wary about creating a new supply glut, as the market will see a seasonal dip in demand in the winter. Riyadh is running the risk of a supply crunch in the fourth quarter, but Saudi officials fear the opposite problem if they increase production too much. Related: Is Trump Eyeing A Coup In Venezuela? How much spare capacity does Saudi Arabia have? As the oil market tightens, scrutiny over Saudi Arabia’s spare capacity is picking up. Saudi Arabia claims it can produce up to 12.0-12.5 mb/d, implying spare capacity of at least 1.5 mb/d. Analysts and industry insiders are skeptical. Bloomberg reports that executives at the Asia Pacific Petroleum Conference in Singapore privately questioned Saudi Arabia’s ability to even go beyond 11 mb/d. “Near-term spare capacity is effectively maxed out,” Amrita Sen of consultant Energy Aspects Ltd. said. Texas frac sand replacing Wisconsin white sand. Shale drillers have relied on high-quality white sands from Wisconsin for their operations for several years, but new sand mines in Texas are opening up, pushing out sand supplies from far away. Hi-Crush Partners (NYSE: HCLP) announced plans this week to idle an operation in Wisconsin due to “temporary softness in completions activity and frac sand demand,” the company said. The decision is a sign that new Texas mining operations are making the market tough for sand suppliers that are located far away from drilling operations. Oman benchmark price surges. The Oman oil benchmark on the Dubai Mercantile Exchange spiked this week as speculators bid up the price on fears of supply outages in Iran. The Oman price gained 11 percent in two days and is now more expensive than Brent. “It is very unusual to see DME at a premium to ICE Brent, let alone at such a high level. Given that the vast share of Omani crude is delivered to China, it is easy to conclude that it is the main driver for this unusual jump,” JBC Energy said in a note. Permian pipeline woes may not be so bad. The pipeline bottleneck may end sooner than expected as pipelines are being fast tracked, according to a new report from Raymond James. 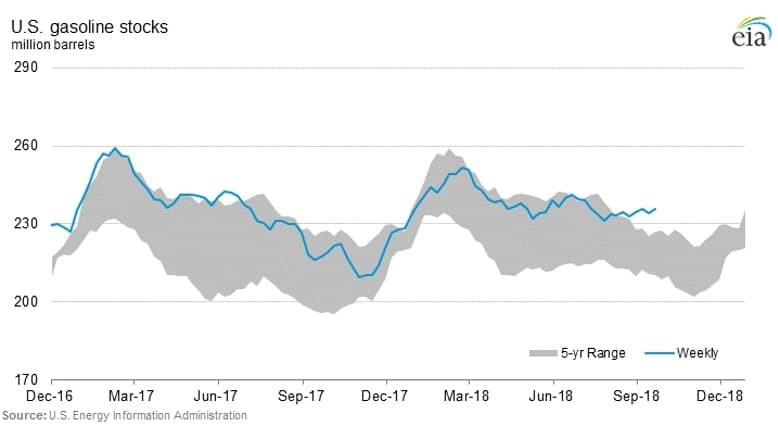 The backlog should ease by late 2019, and the discount for WTI in Midland won’t be as wide as feared. The firm downgraded its estimated discount for Midland WTI to just $15 per barrel relative to Brent, down from an earlier estimate of $25. Shell looks at stake in Gazprom project. Royal Dutch Shell (NYSE: RDS.A) is reportedly considering buying a stake in a project spearheaded by Russian gas giant Gazprom. If Shell moves forward, it would be a rare move into Russia, which has been under western sanctions since 2014. “For Gazprom Neft, it’s a chance to raise quick money, while for Shell - to get cheap reserves,” a source told Reuters. ExxonMobil completes phase of Beaumont refinery. ExxonMobil (NYSE: XOM) said that it has completed a nearly $500 million expansion of its Beaumont refinery, which will give it greater capacity to refine light oil from Texas shale fields. More expansions are on the way, including a plastics production facility. The Beaumont site could soon become one of the U.S.’ largest refineries. SEC sues Elon Musk. Elon Musk has been sued by the U.S. Securities and Exchange Commission for fraud related to Musk’s tweet about possibly taking Tesla (NASDAQ: TSLA) private. The suit could result in Musk being barred from running the company. Tesla’s share fell more than 4 percent in after-hours trading on Thursday. New battery could break lithium dependence. A new battery from NantEnergy, headed by the California billionaire Patrick Soon-Shiong, operates on only zinc and air, and may even cost less than lithium-ion batteries. The zinc battery could allow the energy storage industry to move beyond lithium, where production is concentrated in just a handful of countries and is expected to struggle to keep up with demand. With the robustness of the global oil market fundamentals, OPEC/Russia’s inability to add more than the 650,000 barrels a day (b/d) which Saudi Arabia and Russia combined have already done and with persistent question marks about Saudi proven reserves and production and spare capacities, a $100 oil price is not an if but a when. At one time a hint from Saudi Arabia about oil production could have sent oil prices rocketing or declining. Alas this is no more the case. Saudi claims about the size of its proven oil reserves, spare capacity and its production capacity are currently under global scrutiny. Doubts about Saudi reserves were one of two major reasons for the withdrawal of the IPO of Saudi Aramco from the market altogether. The other was the risk of American litigation. King Salman of Saudi Arabia couldn’t have been clearer when he justified his decision to withdraw the IPO for not wanting to expose Saudi oil reserves and finances to scrutiny. Saudi Arabia claims that it has a production capacity of 12.5 million barrels a day (mbd). 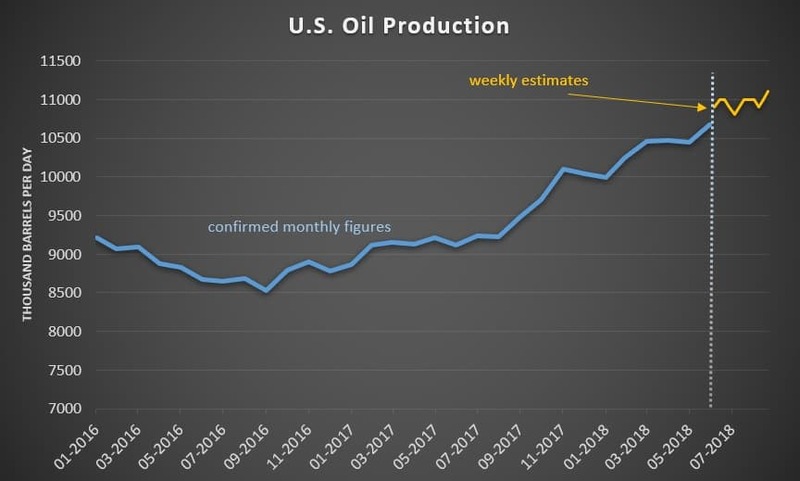 This can’t in any stretch of the imagination be true because despite repeated calls by President Trump to Saudi Arabia to significantly increase its oil production so as to save his neck at the coming Congressional midterm elections in November, it managed to add only 400,000 b/d to the market and even these did not come from new production but from oil stored on board tankers or on land. Saudi oil production peaked at 9.6 mbd in 2009 and has been in decline since. As for Iran, I have been saying for a while that US sanctions on Iran are doomed to fail and that Iran will not lose a single barrel from its oil exports. Analysts and various experts should heed my words. Despite insistence by many analysts and experts that the IPO of Saudi Arabia will go ahead, I kept telling them for almost nine months that it will be withdrawn altogether and that is exactly what happened. I was proven right and they were proven wrong. The same thing will happen with US sanctions on Iran oil exports. Can we get real here for just a moment? Anyone who actually TRADES oil must know that today's (Friday, September 28th) price increase was mostly due to today being the last trading day for the month of September. That's it. I predicted it, as I've observed it many, many times before...headlines love to boast about a particular trend (e.g., oil's upswing in price aka bull market) so today couldn't end by having prices for WTI retreat back towards $70/bbl. 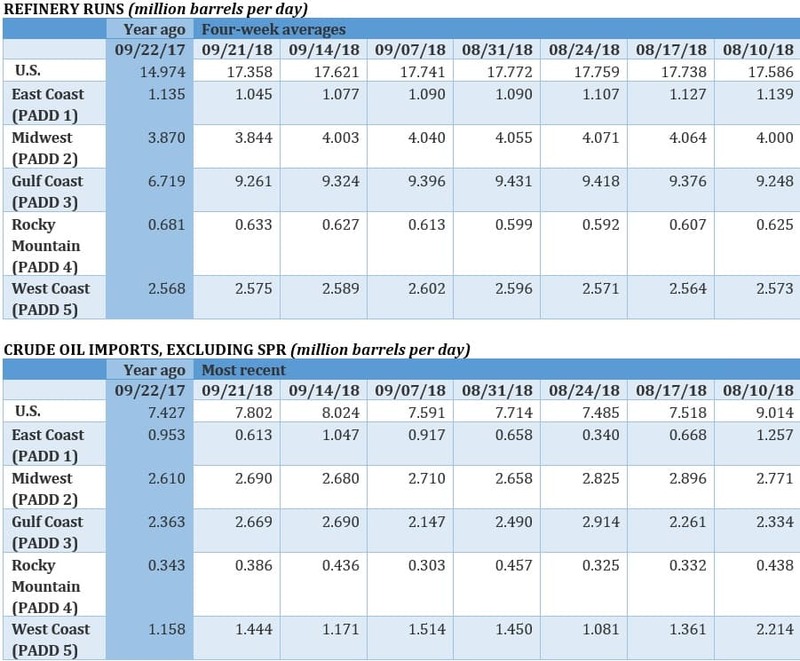 Just as last week saw the last trading day for the contracts for October delivery...also conveniently yet not mysteriously up for oil traders. A few weeks ago WTI was having a "bearish spell", when prices were still in the upper-$60s/bbl. Yeah right...the difference is that in a "bear market" for oil, that just means that prices don't move up as much--but they certainly don't go down! But on bullish days, the prices are allowed to move more than any bearish report from the EIA or API (like we just had this week). I'm tired of every "news" site that reports on oil stating that oil is up on "Iran sanctions" while ignoring that official sanctions have not yet begun. This headline is thrown around like a "Get out of jail-free" card for the benefit of bullish hedge fund managers and producers. This was daily with "talks of producer cuts" in 2016 and threw the words "on hopes of" and it actually worked! They also do it to avoid down days in oil by posting "But, Venezuela..." or is it Nigerian rebels? Libyan production down? 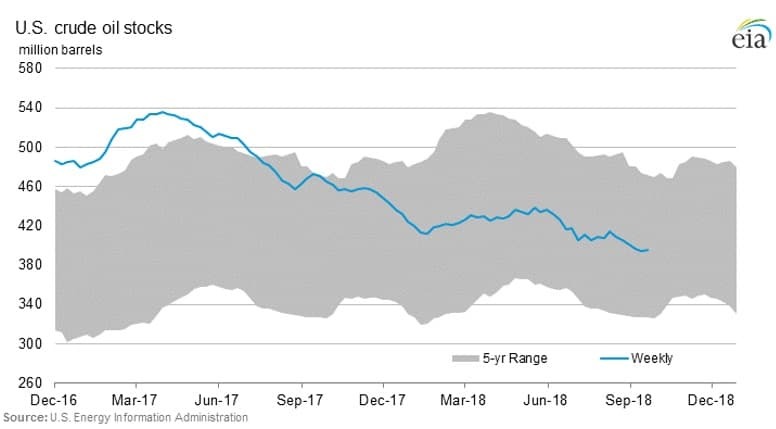 I for one refuse to believe there is a supply crunch now simply because one (1) OPEC nation (Iran) will begin sanctions on oil beginning on November 4 and somehow the entire world's oil supply is thrown off? There are numerous articles on this very site right now mentioning increases in supply from the Saudis, Russians, U.S.A., and more but how come that doesn't affect the market? Why is it that on a down day for the markets, prices often retrace a whole percent back up due to short-covering, but on "up" days the price hovers near session highs constantly making new highs and never "unwinds"? Case-in-point: The pits at the NYMEX closed at 1:30 PM Central with WTI at $73.25 and finished for the day at $73.56 (already up $0.31/bbl for the next session). Notice that this past session opened significantly higher than it closed at and the lows never even went near the previous closing price! The opposite never happens on "down" days. I'd like for anyone and everyone who actually trades WTI to have their trading platform up the next session: Look at the price-ladder (vertical-view of buy and sell orders) and all I ever see are sell orders (up to 10 cents above the current market price) that are 3 digits, whereas all of the buy orders (down to 10 cents below the current market price) and some are single-digits. This means that at practically any given time, there are far more sell orders than buy orders. Yet the price doesn't move lower--sometimes for almost an hour! But then, algorithmic trading on the hour causes prices to somehow blast through as much as 30 cent upward moves in a second. It's the equivalent of playing the card game war--you have Aces, Kings, Queens, and Jacks...I have 2s, 3s, 4s, 5s, 6s, etc. and instead of me losing the game is somehow stalled and instead I commandeer my way through all of that. I'd love an explanation for this. Please understand something--I have lived in the U.S. my whole life. I've lived in New York, California, North Carolina, New Jersey, and currently Texas. I'm an American. I know what it's like to have Donald Trump for president. I also know that approx. 90% of us Americans are not rich like the ones you see on TV shows. Yes, we do have millionaires in small towns and in every major city across the country, and our well-known billionaires are sporadically placed. But most of us are quite dependent on our jobs. Wages do not keep up with the cost of living. Health insurance is mandatory, and it costs my family more than our mortgage payment. Rent for many people who might have a college degree with many tens of thousands of dollars in debt and work at Starbucks as a barista is often 50% or more of their income for a small dwelling. Once and for all please try and understand that $100 oil let alone $130 oil is unsustainable for approx. 297 million of us. As it is, there is currently an "artificial" demand for oil when our highways with limited lanes create rush-hour and automobile-accident traffic jams. This means we all have to gas up after waiting even though we can walk faster than traffic moves and certainly get someplace quicker with a bike. Oil in any form is simply not a necessity for life as a human being. More of us CONSUMERS are understanding this. So, please put your foreign calculator away with talk of speculating your way towards triple-digit oil. If we really wanted it that bad, for goodness sake, we can just commandeer it ALL anytime with our huge military budget. Perfect question for Tom. I'm looking through the news on US shale plays, I see China is pulling out of Eagle Ford because of sanctions. Chesapeake sold them rights in 2010 and 2013? Chesapeake was the driller to teach them new technology for the cash Chesapeake needed. After 8 and 5 years of using the Chinese money to explore and drill Eagle Ford, now considered a hot play and since Chesapeake just issued a senior note offering right after announcing a 2 billion dollar sale of another shale area, is it a good bet Chesapeake has first rights to repurchase the prime areas back from the Chinese who received their value in learning the new technology for exploring China? And did Chesapeake therefore just hit paydirt?